Mechanical urethane rollers are used in a good number of industries such as product manufacturing industry, food processing Industry, banking (currency counting machine), product packaging industry, bottling and canning Industry and lots more. Plan Tech manufactures mechanical urethane rollers that allow easy grip, slip, cushioning, deflection and abrasion resistance in the operating environment. Our Mechanical Urethane Rollers are FDA compliant for food processing. Can be manufactured in any color and are non-marking. Are resistant to harsh chemicals, acids, abrasion, and solvents as a result of the presence of urethane. 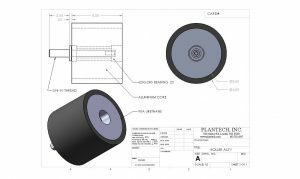 Plan Tech offers an excellent service in the manufacture of mechanical urethane rollers and other related urethane products made from 100 percent Polyurethane. Also, our team of engineers consistently apply speed and precision during the manufacture of our mechanical urethane rollers. Urethane parts offer a wide coverage or range of durometers in comparison to Silicon, UHMW, and Nylon that are of limited range. One of the benefits offered by the wide durometer range of Plan Tech is that urethane parts are that you have the flexibility of choosing the perfect product from a variety of options. You can say goodbye to the issues of sound reduction and shock absorbing with Plan Tech urethane. You certainly can’t do same with Silicon, UHMW, and Nylon due to the significant difference in their capabilities. Where Silicon, UHMW, and Nylon will fail you in resisting Ozone and Oxygen, Plan Tech’s polyurethane’s will efficiently do the opposite – which is, resist Ozone and Oxygen. Are you interested in cast mechanical urethane rollers? Please Contact us so we can help solve your requirements and work with you on your specific application!